If you ask Caroline what her favorite food is, she'll tell you "spadetti and mac & sheese." She's a carb-loving girl after my own heart. So when I set a bowl of this chicken saltimbocca spaghetti in front of her, I wasn't expecting her to tell me that "This is NOT spadetti." I replied that it's just a different kind, and she seemed happy enough with that answer. And once she tried it, she was definitely a fan. So spaghetti still reigns as her favorite food, huzzah! This is a deconstructed version of chicken saltimbocca, so there are the usual suspects: chicken, crispy prosciutto, and sage. But since it's served as a one-pot pasta dish, you also have tender and flavorful noodles that are cooked in the skillet in a mixture of chicken broth, white wine, and water. There's plenty of garlic, a good dose of lemon for some brightness and freshness, and it's finished off with some briny capers. Between the capers and the prosciutto, it seems like this may be too salty, but just be careful when seasoning the dish. By itself, it may seem a little bland, but with the garnishes it is perfect. Adding too much extra salt would definitely make it too salty. I absolutely loved this dinner - way more than I expected too, since I'm typically not a huge fan of capers or sage - it's easy to go from "pleasantly herbal" to "Christmas tree" with sage. But pan-frying in a little oil made the leaves crispy and perfect. I could have just eaten them all on the spot. And the little briny bits of capers were a pleasant addition as well. This was a fairly quick and very comforting meal that celebrating so many of the homey flavors of fall. I hope you enjoy it as much as we did - and if you're in the northeast, I hope you're faring okay in the midst of Sandy! Stay safe! Heat 2 Tbs of the oil in a 12-inch nonstick skillet over medium-high heat. Add the prosciutto and cook until crispy, about 5 minutes. Add the sage leaves and continue to cook until the leaves are crisp, 20-30 seconds. Use a slotted spoon to remove the prosciutto and sage, and transfer to a paper towel-lined plate. Reduce the heat to medium. Pat the chicken dry and season with salt and pepper. Arrange in a single layer in the now-empty skillet and cook until browned and cooked through, about 5-7 minutes per side. Transfer to a cutting board and cover loosely with foil. Add the remaining tablespoon of olive oil to the skillet, and stir in the onion. Cook over medium heat until softened and golden, 5 to 7 minutes. Stir in the garlic, minced sage, and red pepper flakes and cook 30 seconds. Stir in the flour and cook 1 minute, then whisk in the wine and simmer until reduced by half, about 1-2 minutes. Slowly whisk in the broth and water, then stir in the pasta. Increase heat to medium-high and cook at a vigorous simmer, stirring often, until the pasta is tender and the sauce has thickened, 12-15 minutes. While the pasta cooks, shred or slice the chicken into bite-sized pieces. 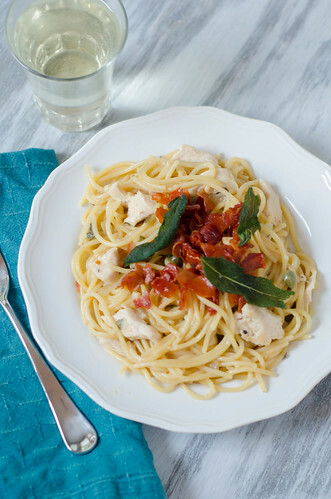 Once the pasta has cooked, stir in the chicken, capers, butter, lemon zest, and lemon juice. Cook until the butter melts and the chicken is heated through. Off heat, season lightly with salt and pepper. Divide the spaghetti among serving bowls, and sprinkle each serving with crisped prosciutto and sage leaves (I liked the sage leaves crumbled over the top so you could get some in every bite!). I have to say, now that I'm thinking about it, I do kind of miss that salty flavor of saltimbocca. It really is kind of addictive! Hooooooly. I'm dying right now. Your recipes have been major hits! I can't wait to try this as I love that chicken dish in restaurants and love the idea of making it a spaghetti...Hubby will be thrilled as he can't have tomatoes so this is perfect. I will let you know how it turns out! "pleasantly herbal" to "Christmas tree" This is exactly how I feel about rosemary. Yum! Little bit messy to make but worth it for the happy belly after!! This was delicious and quite easy and speedy to make considering the end result. Wow! Chicken Saltimbocca is one of my favorite dishes but it sure does take a while to make. I love that this is a one pot meal and so simple!